Pyxis Bundler is a tool for software developers. Pyxis Bundler was designed to create an Apple Application Bundle from Java source code. The bundled application can be installed as a native application on a compatible Apple computer. Create the latest Apple ICNS icon (multi-size) from a PNG file. Embed a JRE so the user does not need Java installed on their machine. Pyxis Bundler is an easy to use application that packages Java archive files (jar files) into an Apple application bundle. You can embed your own JRE (Java Runtime) so the user does not need to have Java installed on their machine to run your application. In Pyxis Bundler you can Save & Reload your past settings, you can also incorporate your own custom splash screen for your application. 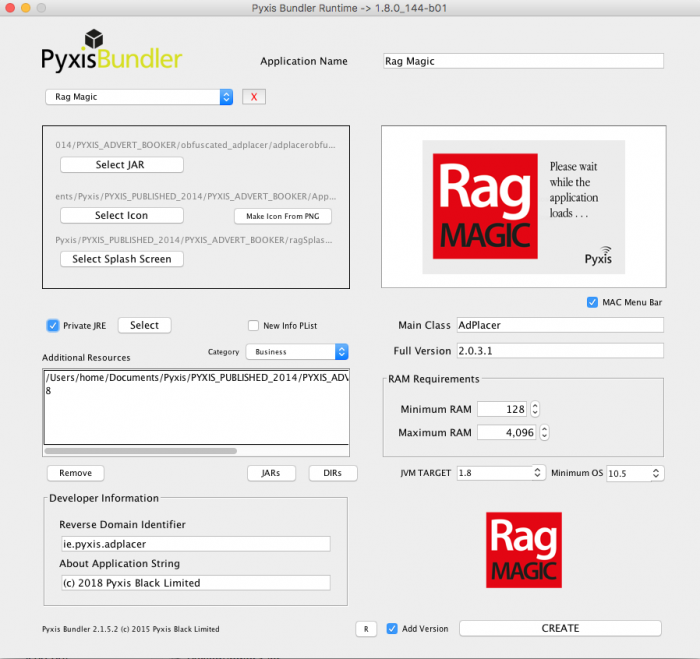 Pyxis Bundler creates your application bundle in seconds so little to no waiting time. You can also create an Apple Icon Image from within the application (icns file type). You have the options of building your application with a single runnable jar file or you can include library folders and other jar files alongside your main runnable jar file. Note that this application was originally developed to run on Yosemite, but performs perfectly on macOS Sierra. Note that this is a Mac only application! AS Jar Bundler is not supported on recent Apple Operating Systems, Pyxis Bundler is the ideal replacement.